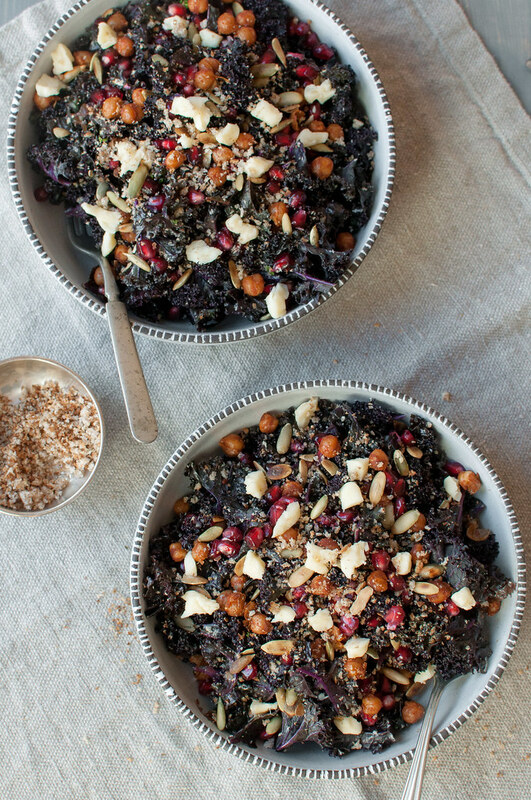 The number of salad recipes on NCK is growing with alarming speed, considering that I describe myself as the opposite of a salad lover. A salad hater? 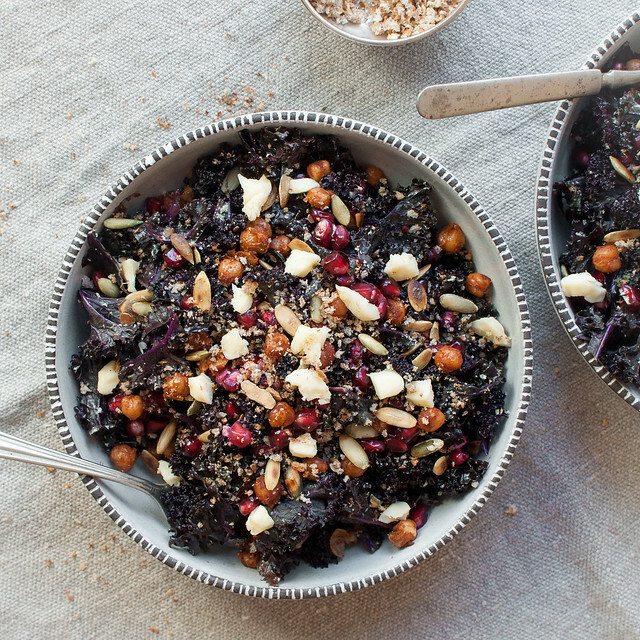 I wouldn’t go that extreme, but know that if you’re reading a salad recipe on this website, especially a kale salad recipe, all the more intimidating to the salad hater, it’s gonna be dang scrumptious. A day before our wedding, just a month ago, Steve and I sat with our bridal party at Red Cow in St. Paul, Minnesota, in celebratory spirits but nearing the point of hangry. Tristyn picked the spot which has redeemed her from a certain brown deviled egg dinner incident in NYC. A two story restaurant in a residential, historic neighborhood, every patron seemed to be having a Friday lunchtime cocktail, and every dish we eyed while waiting for our starter chips and dip (chips and dip!) looked absolutely mouthwatering. In case you’re wondering, yes, I did eat breakfast. However, the last thing a bride really wants to do before her big day is go face first into a huge greasy (veggie) burger or grilled cheese. Actually, that’s exactly what I wanted to do, but I didn’t want the bloat. The chips and dip and massive basket of heavily battered onion rings probably negated my good intentions, but the special fall kale salad that day called my name nonetheless. What landed in front of me was the most inspiring salad I’ve seen since my last visit to Pizzeria Lola (an Asian-y kale “side” salad with watermelon radishes, breadcrumbs, and miso dressing): a pile of massaged kale coated in just the right amount of brown butter vinaigrette, roasted butternut squash, sweet pumpkin seed brittle, and juicy pomegranate. I don’t even remember the cheese situation, and that, my friends, tells you that it was a seriously bumpin’ salad. Somehow I made a note of the recipe in a place where I remembered to return to it after all the wedding hubbub and honeymooning. I had to include it as a centerpiece (not just for looks) at my vegetarian Thanksgiving. The only problem? Up to this point, my concept of brown butter consisted of some magical nectar often praised in the world of baking blogs. Ugh, research time. Can I tell you it was worth every detailed “how to brown butter” article I analyzed because now I have an excuse to eat a healthy kale salad…covered in butter? My hubs will barely touch that green leafy veg with a ten foot pole, and he somehow just knows when I’ve subbed it for spinach in his morning smoothie. Maybe it’s all those marriage love vibes, or maybe it’s the brown butter vinaigrette, but he’s changed his ways and voluntarily confessed his affection for what has officially been named the winter house salad at Natural Comfort Kitchen. As someone who’s just learned how to brown butter, I have a few words for you if you’ve never done it before. The experts may or may not agree. Second, use a small, light colored pan if possible. I love cast iron, but it’s no good here, because you can’t see when your butter starts to brown. Third, have the rest of the vinaigrette recipe ingredients or a measuring cup close by. Once the butter browns, it’s important to get it out of the pan so it doesn’t continue to cook, i.e., burn. If you pour it into a glass measuring cup you can also admire its pretty color. Fourth, be patient. I feel like a lot of “recipes” I read for browned butter indicated that you should see final results in as little as five minutes. Mine took more like 10 to 15. I played it safe, working with lower heat and decreased risk of burning. Finally, it’s a bit technical, you can ruin it, but it’s not too tricky if you just use your eyes and nose. If you do manage to burn it on the first round (*hand raised*), butter is fairly inexpensive, and I hope you have a stockpile in your refrigerator. This isn’t a post (entirely) about browning butter. I hope my pointers are helpful, but if you really want to get educated before you begin, read this. 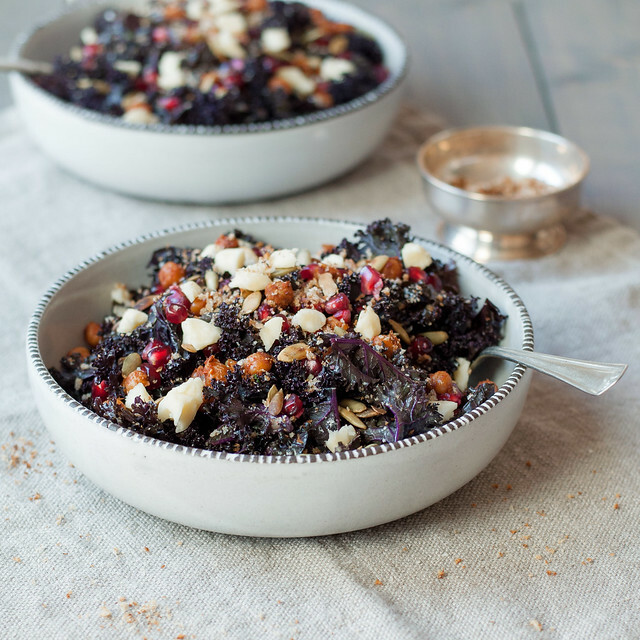 …and more on my main dish salads Pinterest board! As with most salads, this one is quite flexible. Here’s a similar bowl I threw together post-Thanksgiving with green (not purple) kale, leftover roasted butternut squash, and wine glazed lentils and vegetables. 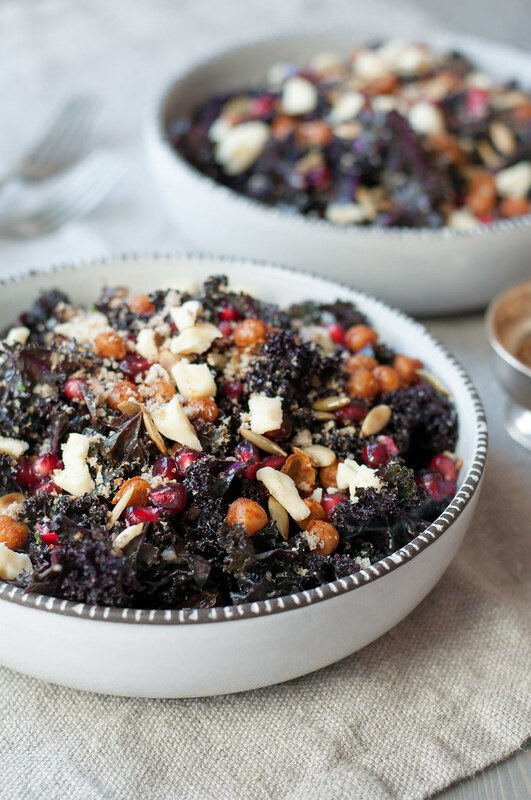 A perfect winter salad of hearty kale, spiced roasted chickpeas, toasty pepitas, juicy pomegranate, creamy cheese crumbles, and breadcrumbs for a bit of crunch, all tossed with comforting shallot and brown butter vinaigrette. 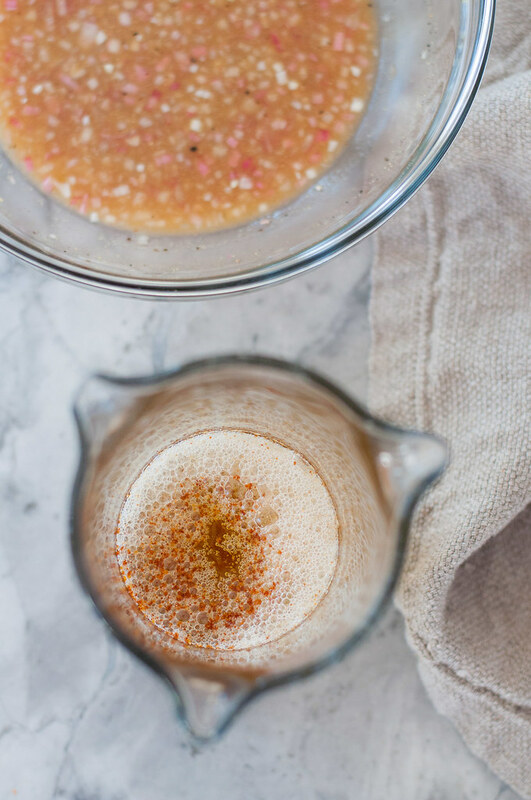 Combine shallot, both vinegars, maple syrup, mustard, ½ teaspoon salt, and a few grinds of pepper in a bowl or liquid measure. Meanwhile, cut the butter into tablespoons and heat in a small pan over medium low heat. After it melts, stir or shake the pan frequently. The butter will bubble and foam (it will be noisy). Once foam subsides, carefully watch butter as you continue to stir. You'll see particles in the butter start to turn brown and it will begin to smell nutty. At this point, immediately remove from heat and the pan. Drizzle butter into the vinegar mixture while whisking. Allow to cool 5 minutes or more, then gradually whisk oil in until emulsified. Season to taste with more salt and plenty of pepper. Cool to room temperature, stirring occasionally to prevent separation. Store, covered, in the refrigerator. 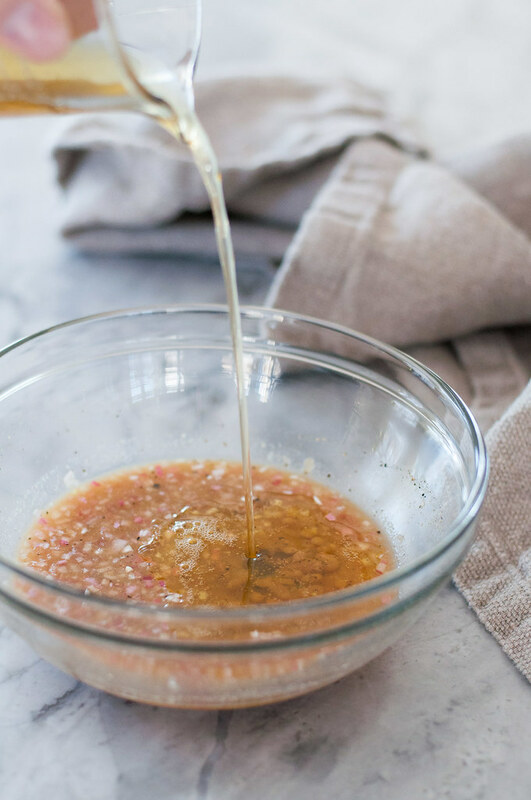 If making vinaigrette ahead, bring to room temperature for up to an hour. Heat quantity needed in a small saucepan over very low heat. Massage kale with a pinch of sea salt, then drizzle with a teaspoon of oil and toss with your hands, rubbing the leaves to coat with oil. Set aside or store in refrigerator for up to two days. 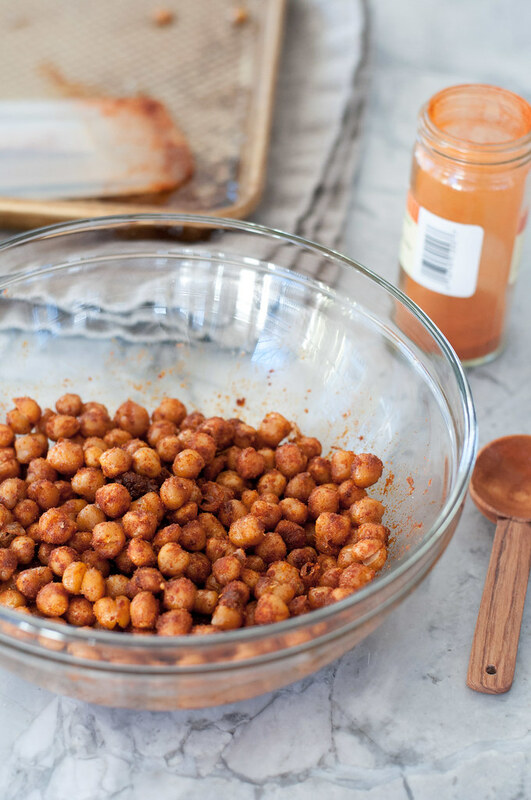 On a rimmed sheet pan (these are my favorite), toss garbanzos with 2 tablespoons oil and a big pinch of salt. Roast for about 15 minutes, until sizzling and just beginning to brown. Stir or shake the pan once or twice during roasting. Measure cumin and paprika into a medium mixing bowl. Add hot chickpeas with excess oil and stir to coat well. Set aside. Toast pepitas in a dry skillet over medium heat, until mostly browned and some begin to puff. Cool on a towel. 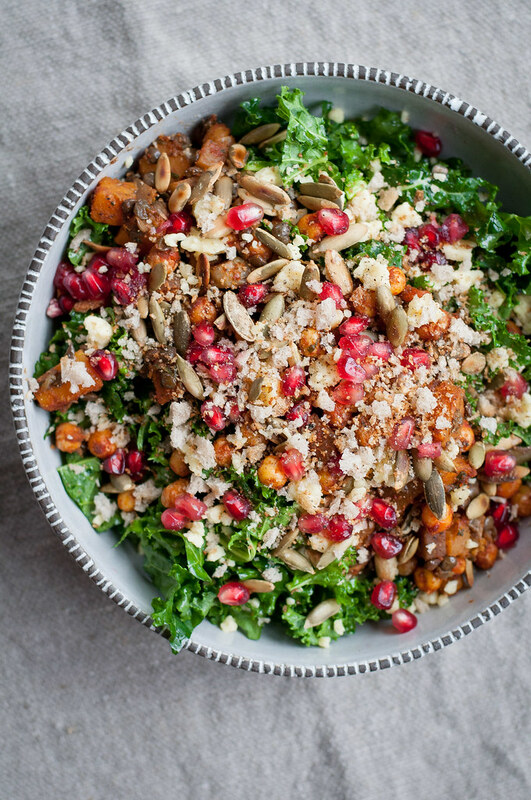 Toss kale, half the breadcrumbs, and ½ cup vinaigrette (for four salad) until coated. Top with pomegranate, spiced garbanzos, toasted pepitas, cheese, remaining breadcrumbs, and a few grinds of fresh cracked black pepper. Salad and dressing inspired by The Red Cow in St. Paul, Minnesota. 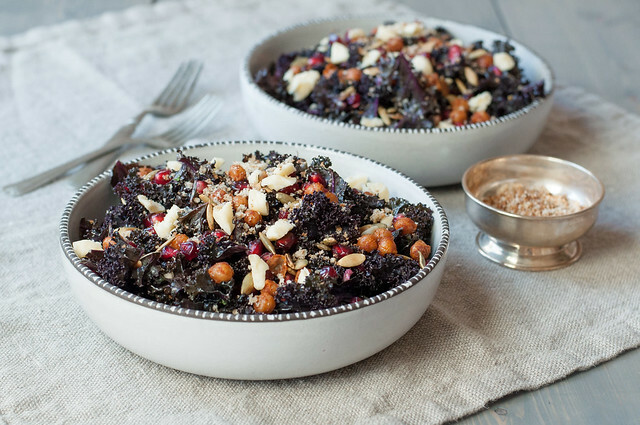 Purple kale is especially pretty with this salad, if your grocer carries it. Check with a speciality cheese shop for Cornish yarg cheese. It's a mild, creamy cheese--much less assertive than blue cheese or feta--that crumbles nicely. Many sources suggest toasting breadcrumbs in oil. However, I simply heat a well-seasoned cast iron skillet over medium heat, add fresh breadcrumbs made in the food processor, and stir occasionally until they start to brown. They'll get even crispier as they cool on a paper towel. Note: This page contains affiliate links. It does NOT contain sponsored content. 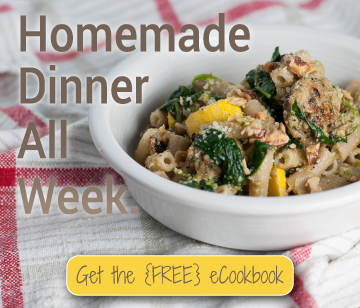 Affiliate links (to products I recommend, on Amazon) offset my ingredient and website maintenance costs, so I can keep bringing you buttery recipes like this one. Thanks!